"Will you be celebrating Jim Jones and David Koresh&apos;s birthday?" gadfly Arnold Sacks dramatically said during public comment before the City Council voted to approve around $40,000 in fee waivers—meaning the city absorbs the costs of paying overtime for workers to shut streets down—for special events around the city, including $3,000 for a L. Ron Hubbard Birthday Event taking place Saturday at the Shrine Auditorium. Activist and pain-in-the-council&apos;s-neck Zuma Dogg hypothetically questioned what the public would want to do with a $5,000 gift to the city. Would you rather have "homeless services on skid row, give it to the underprivileged kids of LAUSD programs, how about keeping the parks an libraries open that we&apos;re thinking of cutting," he asked. "With all due respect, you got people like John Travolta and Tom Cruise that are part of this organization, how about if they can chip in and pick up the tab?" The motion was passed unanimously, although Councilmembers Eric Garcetti, Tom LaBonge, Ed Reyes and Bill Rosendahl were absent from the meeting. "This annual celebration recognizes the achievements of Mr. Hubbard, Founder of the Scientology religion, and honors Churches of Scientology internationally," wrote Councilmember Bernard Parks in the motion (.pdf). 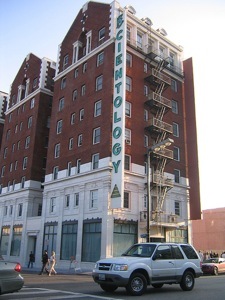 "The event is attended by over 7,000 local Scientologists, their families and friends, as well as by representatives of other religions and professions."